Pontifical Catholic University of Peru, B.A. 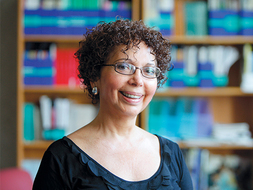 Cristina's publications include books like Unveiling Differences, Finding a Balance (IUCN, 2004), Desenredando el Laberinto (IUCN, 2002) Migracion, Familia y Socializacion: los cortadores de cana de azucar de Patapo-Pucala (CE&DAP, 1987), more than 15 articles in peer-reviewed journals, in addition to book chapters and technical reports. In addition, Cristina has been serving as a reviewer and article editor for major peer review journals such as Human Ecology., World Development (Elsevier), SAGE Open Journal and the International Journal of Rural Development (Pontificia Universidad Javeriana, Colombia) on topics of her expertise, as well as reviewing book projects and grant research proposals for SAGE Publications and the Social Sciences and Humanities Research Council of Canada . She participates in several Brandeis events like the 2016 Diversity Conference “Recognize, Empower, Change" and the Teach-in on Indigenous Peoples organized by Intercultural Institute as a response to Columbus Day celebration. Bulga Roba and Espinosa, Cristina. "Indigenous Peoples & Development: the Karrayyu Camel Milk Cooperative in Ethiopia." Celebrating Indigenous Peoples Day. Brandeis Univeristy -The Heller School Room G4. October 8 2018. Espinosa, Cristina. "Menstruation: The Forgotten Reproductive Right? Implications for Development, Women Rights and Feminisms." SID Brown Bag Lunch Series. Brandeis - The Heller School - Room G3. March 27 2019. KARKI, Richa and Cristina ESPINOSA. ""Breaking Taboos: Menstruation, Female Subordination and Reproductive Health. The case of India"." April 2019. Espinosa, Cristina. "Indigenous rights, indigenous entrepreneurship and autonomous sustainable development." Indigenous Peoples Day Teach-In. Brandeis Inter-Cultural Center. October 9th 2017. Espinosa, M. Cristina. "Gender Equity: Inequalities and Education in Latin America." Latin American Education Forum. Harvard Graduate School of Education. April 15 of 2016. Espinosa, M. Cristina. "Indigenous Peoples, progress and development." Indigenous People's Day Teach-In. event cosponsored by the Intercultural Center and Department of Latin American and Latino Studies. Brandeis Intercultural Center. October 10 of 2016. Espinosa, M. Cristina. "Social Difference and Exclusion and our Visions on Diversity." Brandeis Diversity Conference. Hassenfeld Conference Center. February 27 of 2016. GINTING, Wiranta Yudha and Cristina ESPINOSA. ". “Indigenous Resistance to land grabbing in Mereauke, Indonesia: the importance and limits of identity politics and the global-local coalitions.”." International Journal on Social Science and Business (http://ijssb.com/images/vol1no3/1.pdf ) Vol 1. 3 (2016). Espinosa, Cristina. "Indigenous Peoples and Development." Second Annual Latin American Conference "Identity and the case for regional policies" -panel Conflicting visions: modern economic development models and indigenous minorities. Harvard JFK School for Social Policy. 04/18/2015. Espinosa, Cristina. "“The construction of social exclusion, diversity and identities”.." SEED (Students Exploring & Embracing Diversity) event organized by Brandeis Admissions Office. International Business School - Brandeis. November 7-9, 2014. Espinosa, M. Cristina. ""Indigenous Peoples, the Amazon and Development in Brazil: Whose rights? Whose visions?”." Brazil’s Balancing Act: Reconciling the Demands of Economic Development, Environmental Protection and Indigenous Rights. Organized by IBS/ICEJPL-Ethics Center. (www.brandeis.edu/ethics/events/Brazil). USDAN International Lounge. March 5, 2013..
Espinosa, M. Cristina. "Gender Equity, Health and Cultural Tensions in the Amazon." Woodrow Wilson Research Center - Washington D.C.. 10-22-2012. Espinosa, M. Cristina. "“Taking the pulse of Gender Mainstreaming in Development in times of neoliberal globalization.”." Oxfam America – Boston Office linked via internet with the New York Office. Event organized as part of the Women’s Day Event.. March 2012..
KIMKUNG, Pamela and Cristina ESPINOSA. "“The Gender Dimensions of Violence and Conflict: The Case of Inter-Ethnic Land Conflict in Mt. Elgon, Kenya.." International Journal of Development and Conflict 2. 3 (2012). Espinosa, M. Cristina, ed. “Negotiating Nature, Gender & Modernity in the Peruvian Amazon”. International Journal of Humanities and Social Science., Vol. 1. No. 16 2011. Espinosa, M. Cristina. "“Negotiating Nature, Gender & Modernity in the Peruvian Amazon”." International Journal of Humanities and Social Science. Vol_1. No_20 (2011): <(http://www.ijhssnet.com/journals/Vol_1_No_20_December_2011/2.pdf)>. NAMATOVU, Regina and Cristina ESPINOSA, ed. “Engendering the Global Financial and Economic Crisis: Unveiling the Links between Formal and Informal Sectors in the Mining regions in Zambia and their Gender Implications.”. International Journal of Business and Social Science, Vol 2. No.20 2011. Espinosa, M. Cristina. "Globalization and the Separation of Indigenous Genetic Resources from Indigdenous Peoples: The Blooming Alpaca Industry in the USA and its Impact on Andean Alpaqueros." The Fourth World 8. 2 (2010). Espinosa, M. Cristina. "Why Gender in Wildlife Conservation? Notes from the Peruvian Amazon." The Open Journal of Anthropology 3. (2010). Espinosa, M. Cristina. "“Negotiating Nature, Gender & Modernity in the Peruvian Amazon”." International Conference Beyond Essentialisms: Challenges of Anthropology in the 21st Century, Department of Anthropology, University of Ljubljana - Slovenia. Department of Anthropology, University of Ljubljana, 2010. NAMATOVU, Regina and M. Cristina ESPINOSA.. “Engendering the Global Financial and Economic Crisis: Unveiling the Links between Formal and Informal Sectors in the Mining regions in Zambia and their Gender Implications.”. UNDP - New York: 2010. Espinosa, M. Cristina. ""Negotiating Landscapes, Survival and Modernity: Goats, Migration and Gender in the Arid Lands of Northern Peru."." Culture & Agriculture 31. 1 (2009): 39-48. Espinosa, M. Cristina. "Ethnic Spirituality, Gender and Health Care in the Peruvian Amazon." Ethnicity & Health 14. 5 (2009). Espinosa, M. Cristina. "What has Globalization to do with Wildlife Use in the Remote Amazon? Exploring links between Macro-economic Changes, Markets and Community entitlements." Journal of Developing Societies Vol 24(4): 489–521 24. 4 (2009): 489-521. Espinosa, Cristina. Unveiling Differences, Finding a Balance. Social Gender Analysis for Designing Projects on Community-Based MAnagement of Natural Resources.. First ed. Quito: IUCN South America/ IUCN Global Social Policy Program, 2004. Espinosa, M. Cristina. Desenredando el Laberinto. First ed. Cambridge, UK: IUCN Publications/IUCN South America/IUCN Social Policy Program-Gland, Switzerland, 2002. Espinosa, M. Cristina. "Expanding Gender Analysis to understand the Interactions between Gender, Demography, Markets and the Environment: Some Findings from the Peruvian Northeastern Amazon." The Florida Journal of Anthropology 20. 1 (1999). Espinosa, M. Cristina. Genero y Trabajo de Campo en Peru. IN: Poats, S., Arroyo, P. Y R. Asar, (Eds.) Genero y Manejo Sustentable de Recursos: Examinando los Resultados. Proc. of MERGE Program International Conference. Quito, Ecuador: FLACSO/ MacArthur Foundation, 1998. Espinosa, M. Cristina and Jazmine Casafranca. Las Mujeres Productoras de Alimentos en Peru: Tecnologia y Comercializacion. Programa de Analisis de las Politicas del Sector Agropecuario frente a la Mujer como Productora de Alimentos en la Region Andina, Cono Sur y el Caribe. INSTITUTO INTERAMERICANO DE COOPERACION AGRICOLA-IICA/ BANCO INTERAMERICANO DE DESARROLLO-BID.. San Jose de Costa Rica: 1996. Espinosa, M. Cristina. "Gender and Economic Responses of Peasant Households to the Structural Adjustment Program in Peru." The Latin Americanist 31. 2 (1996). Espinosa, M. Cristina. Gender, Technical Change and Rural Development in Peru: Exogenous and Endogenous Factors affecting the Division of Labor and Decision Making Process in Farming Systems. Proc. of Symposium Latinoamericano sobre Investigacion y Extension en Sistemas Agropecuarios. Quito, Ecuador: FAO/ Fundeagro, 1995. Espinosa, M. Cristina. "Genero y Desarrollo: Factores Exogenos y Endogenos que afectan la Division Familiar del Trabajo y el Proceso de Toma de Decisiones en Familias Campesinas de Huaraz (Gender and Development: Exogenous Variables affecting Changes in the Division of Labor)." Socialismo y Participacion 61. (1993). Espinosa, M. Cristina. "Implicancias de Genero en el Proceso de Cambio Tecnico en Sistemas Campesinos Andinos. (Gender and the Process of Technological Change in Andean Peasant Systems)." Revista Peruana de Ciencias Sociales 3. 1 (1992). Agreda, Victor y Espinosa, M. Cristina. "Desarrollo Sostenible: El Nuevo Dorado para la Amazonia ? (Sustainable Development: A New Utopia for the Amazon?)." Debate Agrario 12. (1991). Espinosa, M. Cristina. Migracion y Socializacion. Los Cortadores de Cana de Azucar de Patapo-Pucala (Migration and Socialization: The Sugar Cane Cutters of Patapo-Pucala). First ed. Lima: CE&DAP/Consejo Nacional de Ciencia y Tecnologia-CONCYTEC, 1991.